Classical Electrodynamics captures Schwinger's inimitable lecturing style, in which everything flows inexorably from what has gone before. Novel elements of the approach include the immediate inference of Maxwell's equations from Coulomb's law and (Galilean) relativity, the use of action and stationary principles, the central role of Green's functions both in statics and dynamics, and, throughout, the integration of mathematics and physics. Thus, physical problems in electrostatics are used to develop the properties of Bessel functions and spherical harmonics. The latter portion of the book is devoted to radiation, with rather complete treatments of synchrotron radiation and diffraction, and the formulation of the mode decomposition for waveguides and scattering. Consequently, the book provides the student with a thorough grounding in electrodynamics in particular, and in classical field theory in general, subjects with enormous practical applications, and which are essential prerequisites for the study of quantum field theory.An essential resource for both physicists and their students, the book includes a ?Reader's Guide,? which describes the major themes in each chapter, suggests a possible path through the book, and identifies topics for inclusion in, and exclusion from, a given course, depending on the instructor's preference. Carefully constructed problems complement the material of the text, and introduce new topics. 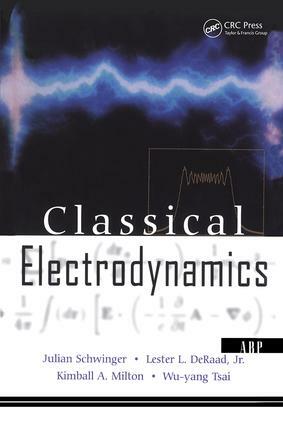 The book should be of great value to all physicists, from first-year graduate students to senior researchers, and to all those interested in electrodynamics, field theory, and mathematical physics.The text for the graduate classical electrodynamics course was left unfinished upon Julian Schwinger's death in 1994, but was completed by his coauthors, who have brilliantly recreated the excitement of Schwinger's novel approach.